SpaceEngineer Next time, use Google Chrome. Google Chrome, because had more features, more safety and more faster. Opera, of course, since 2003(Opera 7). You don't tell me, Opera had more features then Chrome has now when Chrome wasn't even in the plan. However, sometimes I use it as alternative browser. I attribute Chrome's rise in popularity to the advertisement on Google's homepage. Don't get me wrong- personally I use G-Mail and Blogger, and Google does some great stuff, but I don't need Chrome- for me it's overkill. I just don't understand you Chromies. Switch to Firefox! Seriously though, you can go on and on about the pros and cons of both Firefox and Chrome, but it's like comparing lemons and limes. I agree, the popularity of Chrome is essentially due to good advertising. In what way is it overkill? I don't either. I keep hearing Chrome users insist that Firefox takes "four minutes to load" or other absurd claims like that, but I have never experienced this with any of the many computers I've used Firefox on over the years. Those reports sound anomalous to say the least. I've used Chrome and I can't see how anyone can see it as superior to anything. It instantly aggravated me so much that I closed it out and deleted every last trace of it within 20 seconds of opening it. Something has to be REALLY bad for me to have that kind of reaction. Isn't it more like lemons and lemons? They're both web browsers. It's like comparing two different varieties of the same fruit, rather than two different fruits. Maybe that wasn't the best way to put it. Perhaps a better way of saying it is that there's no strong incentive for me, a (happy) Firefox user, to switch to Chrome. Of course, I was just referring to my personal opinion. I like having two search bars. If it makes Chrome fans feel better, I'm using Google as the default search engine. That said, I do happen to have a big screen. The one bar for everything approach does make sense on small screens w/o lots of screen real estate. Firefox is open source. Now, the average user may not care. Open source applications have advantages though- for example, they can be ported to other systems freely, and aren't constrained to the agendas of any company. I wouldn't call myself the best spokesperson for open source software, but I appreciate that Firefox isn't made for profit. I'm certainly not suited to going into excruciating detail on which browsers had which features first (and other types of comparisons). I'm also aware that Firefox for Android had a rough, laggy start, and Dolphin browser works quite well. Firefox for Android has definitely gotten better in more recent releases. I'm surprised how long it took for Google themselves to port their own browser to their mobile OS. They should have been doing so from the start. Finally, SpaceEngine is like a browser... ...of the universe. Ah okay. I thought you might be saying apples and oranges in a different way, and I was arguing it was apples and apples. But I see your meaning now. Firefox on my Android phone was so slow as to be nearly unusable. I switched back to the default browser. Doesn't matter very much to me though since I rarely go online with it. Opera. It's fast, lightweight, has the URL bar i can google from, has the quicklinks on a new tab with background skinning... has the trash can to re-open past tabs... has tab "Linking" and has the BLOODY "File, Edit, View, Bookmarks, Tools, Help" bar at the top. I HATE HOW BROWSERS ARE GETTING RID OF THAT!!!! So thats why i refuse to use chrome. :/ Otherwise Chrome might be okay. Firefox is too bulky, but i love the amount of pluginsiit has.. 1.) Opera Turbo - Loads the image on it's own server, downgrades the quality, and loads it in that place.. So the images looked like crap, but it took only 1 minute to load instead of 20. I loved the poop out of that. 2.) Theres a button RIGHT on the toolbar to switch from No images to Cached images to Show images. Have no fear! 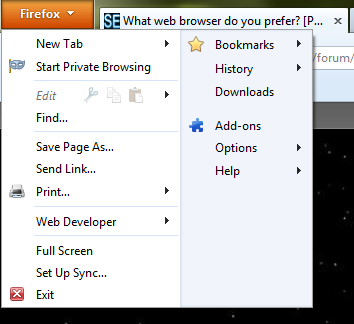 Firefox still has the option to show the normal menu bar. If you choose not to use the menu bar, you get just one menu that combines all the menus into one. It's almost like a Firefox start menu. Plenty of things in the menu are also available as buttons. However, I do understand the importance of redundancy. Just know Firefox still has the menu bar, and I can't imagine it ever leaving the program. Also, I enjoy having both the FF button and my tabs in the title bar in a maximized window. I wish more programs made creative use of the title bar. Firefox on my Android phone was so slow as to be nearly unusable. They've made some major improvements. It's worth a look. Also, as I said, Dolphin browser is pretty nice. I don't really like the default Android browser that much. I get the feeling Google expected alternative browsers to be made for Android, and perhaps chrome for Android wasn't ready, so they just put a browser there since they needed something. In my dial up days, I was still very young (I'm a young adult), and my parents bought me a Blueberry colored iMac (revision D, 333mhz). I still remember using AOL 4.0 on Mac OS 8.6. Boy, things sure have improved. Yeah i know firefox has the option to bring it back, and i appreciate that. I use both chrome and firefox, although i tend to use chrome more, because i find it more user-friendly. Lately i have been using mpc Kromi, which is an improved version of Google Chrome. So I am the only one using Iron.